When the 909 arrived in 1999, it offered excellent value at just £900 for a 140W RMS per channel amp. This figure was into 8 ohms, but it virtually doubled into 4 ohms, meaning it could drive real-world loudspeaker loads unusually well. Still, despite being such a powerhouse it was surprisingly compact at just 321x140x240mm. Every last inch of it was silver-painted cast aluminium alloy, so it was nicely built at the price, too. Round the back, there was a choice of RCA phono socket inputs or a dedicated Quad link for the 99 pre-amplifier, and there were the standard banana loudspeaker binding post ouputs. Like all modern Quad power amplifiers it also had a safety cut-out button in case of severe overheating or overload – not something that was a regular occurrence. Sonically, the 909 is consummately clean, smooth and open. Some will find it a little too timid, in the sense that it doesn’t come up and assault you will all manner of bangs and crashes. But it has an articulate and detailed midband that’s largely devoid of transistory grain. This is thanks in no small part to its Current Dumping system, patented by Quad when it first surfaced on the 405. The amplifier works largely in Class A at normal listening levels, then moves to Class B as the power gets higher. Tonally the Quad isn’t as sumptuous as a valve amplifier, but nor does it have the piercingly clean ‘white light’ of the Sugden Class A designs, for example. It’s little more soft and less stark, from top to bottom. Some might think its bass isn’t as grippy as it could be, but the 909 does tighten up a bit at higher levels, and it’s never a slow or leaden sounding device. In use the 909 has proven itself to be extremely reliable, able to perform at long, loud parties without complaint, even when driving heavy loads such as Celesttion SL6s. 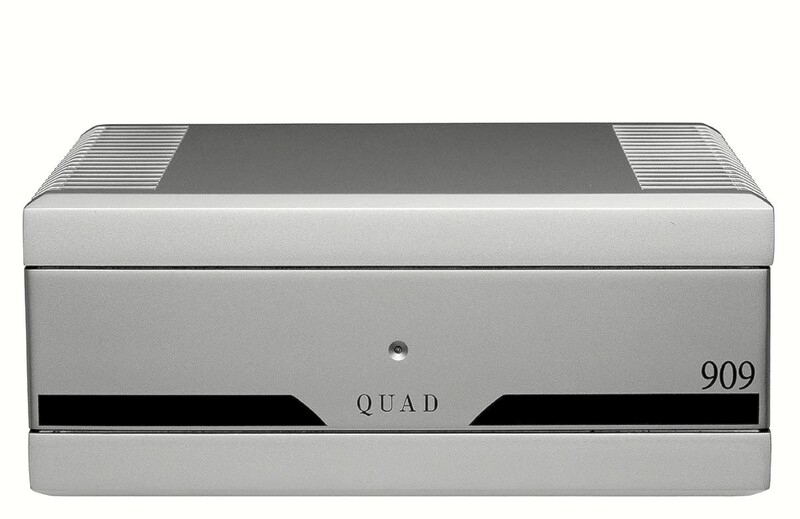 Another bonus is that Quad can service it back at the factory very affordably, as with the 405 and 66 before it. Indeed when serviced and recapped, the 405 can sound not too dissimilar to the 909, and also has the benefit of being the original iconic design rather than a modern reinvention – one reason why 405 prices remain high and 909 residuals don’t. The key to Quad’s 909 is its fuss-free performance with solid power and an even tonal balance. Frankly it’s less fun than a Naim power amp of a similar vintage, but then again it has a certain even-handedness that the latter lacks. It doesn’t draw attention to itself and gets on with the job in a polite and genteel way. Actually, this is just ideal for an affordable power amplifier – as you can leave it to get on with the job of driving quite difficult loudspeaker loads without worrying. It won’t set the world alight with its sublime emotional fluency, or amaze with its entrancing musicality, but the 909 does provide oodles of fuss-free power and isn’t afraid of any loudspeaker you present it with. This is precisely why people have always bought Quad power amplifiers, and the 909 carries things on. Traditional values in a modern setting, you might say.